Please pardon my absence. It was Spring break at our house last week, and just like my children, I too took a break. It was much needed, I am feeling much rested and refreshed. For tonite, I decided to have shrimps for dinner. I used what I had on hand. 1 pack of 24 oz. large shrimps deveined and peeled. I used frozen shrimps, but of course you could use fresh ones as well. If using frozen shrimps, thaw them out by either leaving them in the fridge the night before, or by defrosting them in the microwave. With a paper towel, pat the shrimps dry. Empty the shrimps in a large bowl. Add all the other ingredients to the shrimps and mix well. Marinade for 30 minutes if possible. Turn the oven to 400 and place the shrimps on a large silpat that you would have placed on a large perforated sheet. 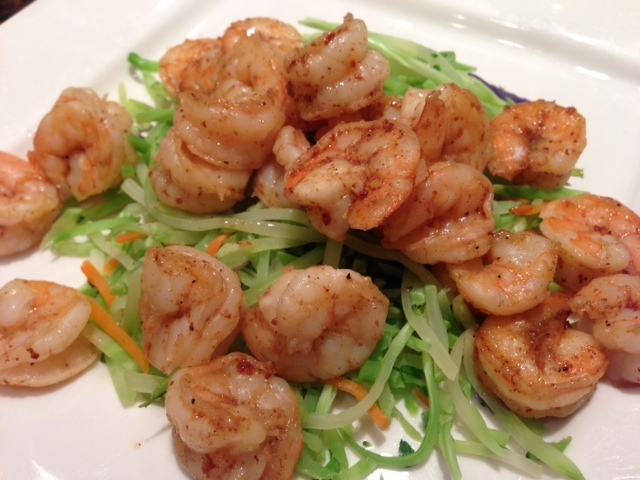 You can also quickly saute the shrimps in a frying pan. Just warm up 1 tbsp of butter and when the butter is sizzling, add the shrimps. Cook them for a few minutes ( 2-3 minutes) or until they are becoming pink. 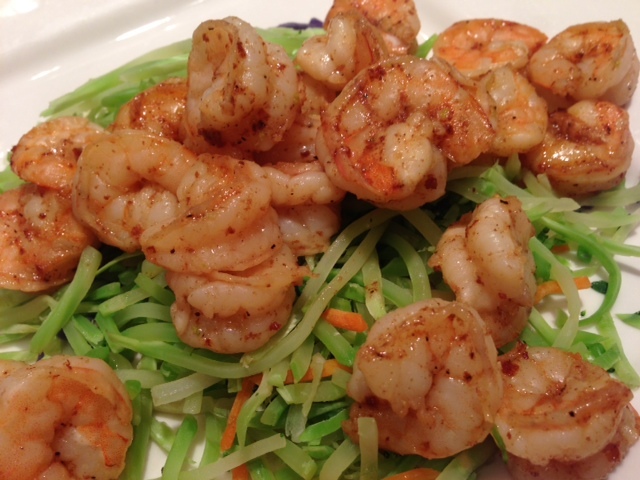 While the shrimps are cooking, empty the broccoli slaw into the large round mold, place the octogonal silpat on top and cook the slaw in the microwave for 3 minutes. Add a dash of salt and pepper into the cooked brocoli slaw and stir. To serve, spoon the brocoli on each plate and place some shrimps on top of the brocoli. Et voila!